Bohzaar is a new collection that is a unique fusion of Bohemian inspiration made in England and authentic crafts sourced from great Artisan craftsmen of the world. Experienced in Interior Design, we are dedicated to bringing you the highest quality cushions, quilts, designer bedding from some of the worlds finest Designers. We combine rich, sumptuous colours and patterns, from India, Asia, and the Arabic countries with fresh English country prints, and classic cool European designs to create a very distinctive collection. 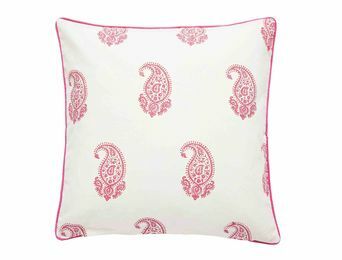 Maya Paisley Cushion - Fuchsia. Hand Block printed 100% Cotton. British Feather and Down insert included. 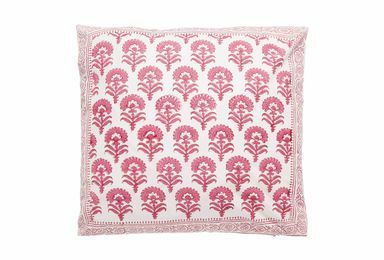 Asha Cushion is a hand block printed Fuchsia Flower 100% cotton. British Feather and Down insert included. 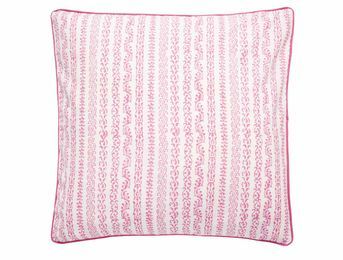 Kanti Cushion is hand block printed, ribbon effect in Fuchsia colour. 100% cotton. British Feather and Down insert included. 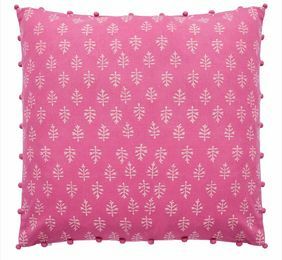 Patta Cushion, Hand block printed Small leaf on a Fuchsia base colour. British Feather and Down insert included.